Super Eagles winger, Victor Moses could face the wrath of the Nigeria Football Federation after Chelsea confirmed him fit for Saturday’s clash against Crystal Palace at Stamford Bridge. 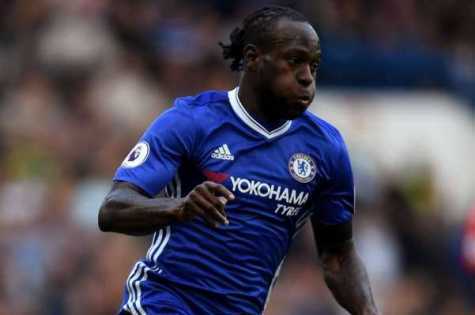 Moses was excused from the Super Eagles friendly tie against the Teranga Lions of Senegal last week Wednesday, an encounter that ended 1-1 at the Hive Stadium in London after he claimed to have sustained an injury while playing for Chelsea. Although he presented an injury report prior to the encounter against Senegal in London, however, the NFF are displeased that the former Wigan star has suddenly return to full fitness level ahead of Palace’s tie. The Chelsea wingback was sent back by coach Gernot Rohr after an examination by the fitness coach of the Super Eagles, but due to his knack for selecting games in the past, many doubted what looked like a genuine case this time around. The 26-year old was part of the goal scorers as the senior national team defeated the Desert Foxes of Algeria 3-1 in Uyo last year October in a 2018 FIFA World Cup qualifier.